Proper care of dental implants is very important for patients who have decided to undergo the implantation procedure. It will not surprise anyone to say that the patient is obliged to conscientiously observe the rules of oral hygiene. The main goal is to prevent excessive accumulation of plaque deposits, which is an important factor that increases the possibility of inflammation. Another important point is the establishment of a calendar of regular check-ups, during which the attending physician can assess the overall condition of the implants as well as the natural tissues around the implant. It is also crucial to examine whether the implant provides the patient with the expected comfort of use and appropriate aesthetic values. We should be aware that it is the patient who is responsible for the rigorous adherence to the above-mentioned procedures. It is a necessary factor determining the success of therapy in a long-term perspective. A good patient should strictly adhere to the general principles of oral hygiene at the planning stage of treatment. It also includes the ability to properly use a toothbrush and dental floss to remove food deposits that accumulate in the interdental space. 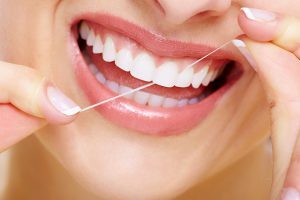 Precise doctor’s instructions for cleaning teeth with floss or special dental fluids can be very helpful, as well as choosing the right softness of the brush. It is important to use the above-mentioned tools both for the care of implants and natural teeth. The tissue surrounding the implant should remain pink, flexible and free from signs of infection. How to deal with plaque? After implantation, it is necessary to establish a calendar of control visits, thanks to which the doctor will be able to verify the actual level of oral hygiene and also control the process of plaque build-up. To reduce the rate of plaque buildup, mouthwashes can be used with preparations containing special chlorochexacrine compounds. However, care should be taken because too much chlorochexidine can cause discoloration and spots on artificial teeth. However, it often happens that plaque tartar is deposited on regularly cleaned teeth and implants. Then, you should consider undergoing plaque removal procedure at the dentist’s office. Clearing plaque deposits very often ends polishing the surface of the teeth crowns, which prevents the placement of the bacterial plaque in the future. The material from which the implants are made is titanium. Currently used implants are covered with additional coatings whose task is to accelerate and deepen the osseointegration process. It is a key factor determining the success of therapy. However, even the best implant and advanced technology will not work if the convalescent neglects its new teeth. Let us be aware that it is the patient’s responsibility to maintain proper oral hygiene. You should look after implants in the same way as for natural teeth. Remembering that in many cases it was hygiene negligence that contributed to the loss of natural teeth.